By popular demand, YourVolunteers now includes the ability to create nonscheduled and virtual volunteering opportunities. For example, if you need volunteer web developers to work on an Intranet project from home but they have full-time day jobs (we use the term "day job" but we all know that web developers work while the owls hoot and while the wolves howl at the moon), you can create a nonscheduled opportunity for the project. After being assigned to the opportunity, the volunteer will then be able to log the times that they worked on the project. The volunteer manager can then approve the times. This System Must be Like a Million Bucks, Right? 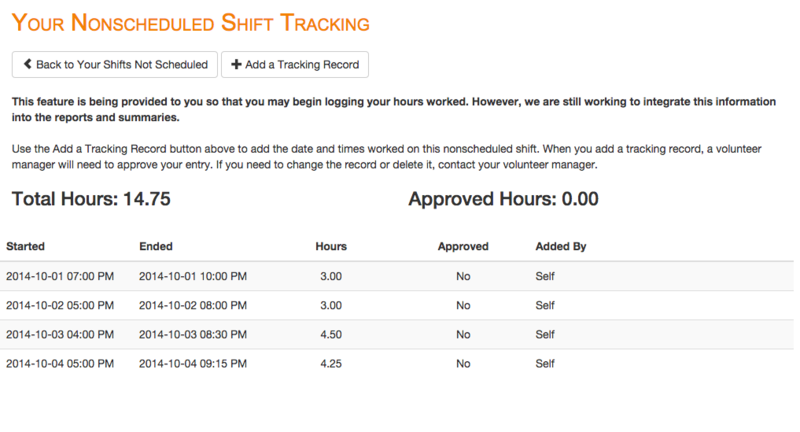 The nonscheduled shifts feature is included in both the free and premium versions of our system.